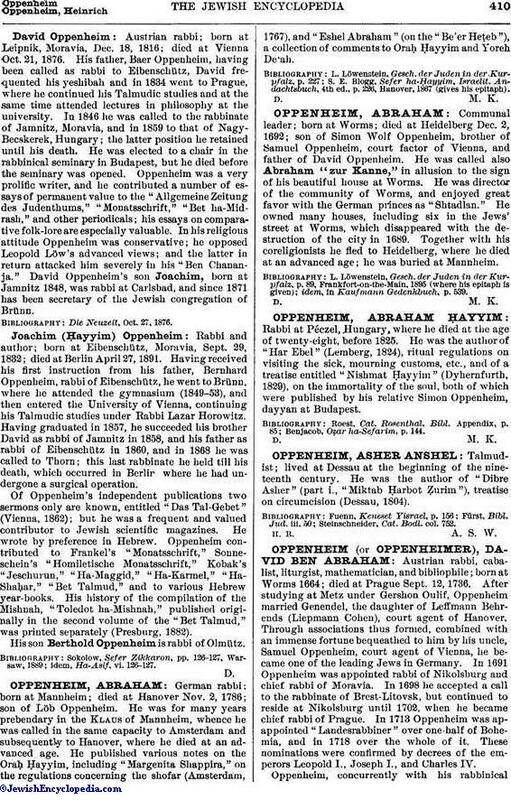 Communal leader; born at Worms; died at Heidelberg Dec. 2, 1692; son of Simon Wolf Oppenheim, brother of Samuel Oppenheim, court factor of Vienna, and father of David Oppenheim. He was called also Abraham "zur Kanne," in allusion to the sign of his beautiful house at Worms. He was director of the community of Worms, and enjoyed great favor with the German princes as "Shtadlan." He owned many houses, including six in the Jews' street at Worms, which disappeared with the destruction of the city in 1689. Together with his coreligionists he fled to Heidelberg, where he died at an advanced age; he was buried at Mannheim. idem, in Kaufmann Gedenkbuch, p. 539.